Thanks to your feedback, Swimia has develop into in just a few months one the most important websites of swimming pools. Here you have got all the info we know about Centro Sportivo Italcementi, in Bergamo. 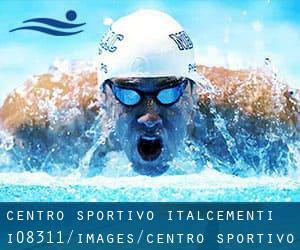 Don't forget you can also promote this pool so Centro Sportivo Italcementi will appear the first of Bergamo, or even the very first of one's country, get in touch with us to know more. Swimmers like you reported 33 meters with a bulkhead usually set at 25 meters, 8 lanes, Indoors. Phone number and e-mail address are number for this Swimming Pool. Updated on 2019 Via Aldo Moro, 9 , Ghisalba , ITALY. This great and large sports center lets professional swimmers like you enjoy 25 meters, 8 lanes, 1.3 meters - 2.7 meters depth, 1.3 meters - 2.7 meters depth, Indoors. Additionally, within these facilities you can try 25 meters, 4 lanes, 1.2 meters - 1.3 meters depth, 1.2 meters - 1.3 meters depth, Indoors. Phone number and e-mail address are number for this Swimming Pool. Via Fattori , Treviglio , ITALY (Postal Code: 24047). This sports center delivers 25 meters, Indoors. For this Swimming Pool, only phone number is number here. Updated on 2019 Via Abate Crippa, 38 , Treviglio , ITALY (Postal Code: 24047). Among all the activities offered by the center, in case you are keen on swimming you can expect to enjoy 25 meters, 6 lanes, Indoors. If you need to contact this Swimming Pool, email address and phone number are both number. Via Selva , Zandobbio , ITALY (Postal Code: 24060). Among all the activities provided by the center, in case you are interested in swimming you will enjoy 25 meters x 12 meters, 1.2 meters - 1.9 meters depth, 1.2 meters - 1.9 meters depth, Indoors. If you need to contact this Swimming Pool, email address and phone number are both number. Updated on 2019 Via Pesenti , Alzano Lomabrdo , ITALY. Swimmers like you have reported 25 meters, 8 lanes, 1.3 meters - 2.7 meters depth, 1.3 meters - 2.7 meters depth, Indoors. Also, you will find 25 meters, 4 lanes, Indoors. If you might want to make contact with this Swimming Pool, email address and phone number are both number. Updated on 2019 Via Marconi, 62 , Romano di Lombardia , ITALY (Postal Code: 24058). Among all the activities offered by the center, for anybody who is interested in swimming you will appreciate 33-1/3 meters x 16 meters, 8 lanes, Indoors. Just in case you want to contact this Swimming Pool before dropping by, we only know the phone number. Updated on 2019 Viale Locatelli, 88 , Dalmine , ITALY (Postal Code: 24044). Swimmers like you reported 25 meters, Indoors. Phone number and e-mail address are number for this Pool.